“Hercules” is now playing at Point, Eastgate, Star Cinema. 2 hours, PG-13, three stars out of four. For once, I’m happy to have been lied to by a movie trailer. The trailer for “Hercules” shows Dwayne “The Rock” Johnson (if ever there was a movie for him to use “The Rock,” this is it) fighting giant lions, boars, even a multi-headed Hydra sea serpent. Yet another super-serious swords-‘n’-sorcery CGI fest, right? In truth, all those battles happen in the first five minutes of “Hercules,” and there’s some doubt as to whether they really happened or are an exaggerated legend. 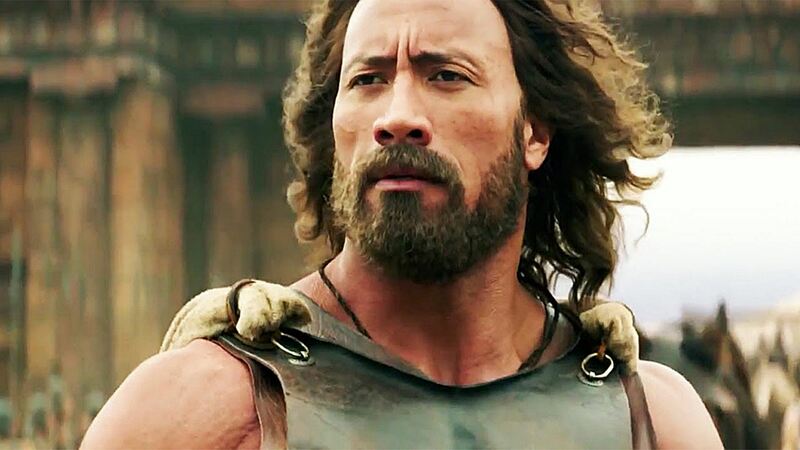 In truth, this is a refreshingly unpretentious “Hercules” with human-sized heroes and villains. It’s really more like a Western — specifically, “The Man Who Shot Liberty Valance” with killer pecs. Taken from the Steve Moore comics, this Hercules may not even be a demigod (“the son of Zeus . . . THE Zeus,” as one priceless bit of dialogue says. You know, as opposed to Steve Zeus from summer camp.) This Hercules is a world-weary mercenary who uses his possibly inflated reputation to inspire the masses and strike fear into the hearts of his enemies. And he accomplishes his feats with a band of sidekicks, including nephew and hype man Iolaus (Reece Ritchie), soothsayer Amphiarus (Ian McShane), and cynical lieutenant Autolycus (Rufus Sewell). It’s fun to see Sewell and McShane, too often typecast as villains, have some fun with good-guy roles for a change. Hercules and his band of merry men agree to travel to the kingdom of Thrace to save its king (John Hurt) from a mysterious warlord who reportedly has an army of centaurs at his disposal. But all may not be as it seems in Thrace — any king whose general is played by Peter Mullan, one of the scariest guys at the movies, might have some secrets. Flashbacks hint at some unfinished business Hercules has back in Athens with another sketchy king (Joseph Fiennes doing a spot-on Jonathan Pryce impression). The battle scenes are the thing, of course, and director Brett Ratner handles them capably enough, mixing top-down aerial shots of formations clashing with in-the-fray hack-‘n’-slash. Some of the effects do seem a little on the cheap, such as a pair of CGI snakes that seem to have writhed right off a laptop screen. But I liked better the bits of humor and humanity that flash between the battles, especially from Johnson. He’s in his 40s now, and while the bod is still Hercules material, his face is starting to get some lines, some character to them. With a past emotional trauma he’s running from, and a suggestion of guilt that he’s not the immortal everyone thinks he is, this is a Hercules who could use a little time on the couch, and Johnson suggests those layers while still gleefully bashing heads with a caveman club. “Hercules’ is by no means a great film, and I hesitate to even call it good — the climax gets quite drawn-out, and Hercules never met a problem who couldn’t solve by lifting something heavy. But in a genre where films like “300” and “Pompeii” seem to think they need a ponderous tone to match their epic visual effects, “Hercules” knows how to show an audience a fun time.